This was my second CDV tour. I planned this one with 2 Australian ladies I met on my first CDV tour in Soriano! We became fast friends and stayed in touch. 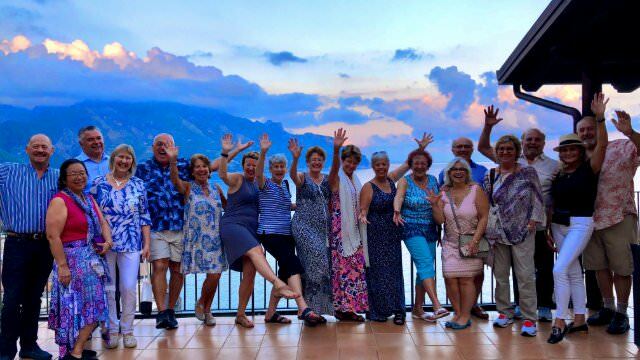 On this tour in Amalfi, we met 3 more single travelers & before we left this extraordinary week, we’d already made plans to meet in Favigana to do our 3rd! This is the essence of CDV, you make everlasting relationships with fellow guests and the hosts. The connections are honestly life changing & incredibly enriching. Amalfi is very special. The scenery is just breathtaking from the gorgeous villa. It is a hike up to the villa daily, but the views make you forget about all those stairs! The infinity pool and patio are magnificent. The days spent on our private boats were my favorite. Swimming, Prosecco, cruising along like royalty. The Mansi family is a riot! Claudia and Filomena truly made the trip so.much.fun! In true CDV fashion, the food did not disappoint and there was plenty of it! You’ll never have Limoncello like you’ll get at the boutique small batch establishment,where you’ll learn to make it here. Buy a lot to bring home or you’ll regret it later! Amalfi does not disappoint!